In showing art, a good idea to keep in mind is that you are setting up a little gallery at the art show as if you were at an indoor retail gallery. Presentation is always important in the art world. I recommend going to some small local art shows or the larger ones in your area to check out how other artist are doing things in your same art medium. It takes time to get a good layout and it will improve with experience. The placement of your art and related display areas is also very important. Careful consideration should be given on where you place your tables, shelves, print racks, walls and other items. Many people will walk down the row of booths and you need to give them a reason to stop and look for a few seconds to determine if they want to stay longer. The booth display pictured on the right, has a very nice jewelry display. Notice the use of grid wall on the left and the fancy table cloth to add elegance. The great use of space by utilizing stacking of the jewelry displays on many different levels. For selling jewelry, you need a mirror. You want to have enough artwork along the walking path to attract their attention and then explore more inside your booth area to examine more of your product. If your booth gets crowded, a design that takes into consideration of customer flow of traffic can help. Even if most of your sales are not the larger framed art, you should still show it to attract people to your booth. Catch their eye and give them a reason to stop and enter your booth. Most people will walk pass most booths and this is normal. They may only be interested in certain things or specific art mediums. If you have art on your walls, you may want to bring a few extra pieces to fill any open spaces due to sales. If no replacements are available, you could rearrange the art on the wall. Another option is to write the word “Sold” on the art title card with a thick black marker and leave an obvious space on your wall. Keep your booth area clean at all times and not so overcrowded with merchandise, sometimes more is not always better. When you design your booth layout, do not have spaces that the customer may feel restricted in. The customer should always feel that they have an easy way out. Do not block too much of the space in the front area with objects or you will reduce the number of customers that walk inside your booth area. The booth layout entrance should be inviting to the customers. Sometimes it is a design challenge to have objects close to the front entrance to your booth so they can easily see and gain interest to stop for a longer look or come inside your booth area and the relationship to not blocking the main booth area entrance area. If there is space between the different booths, you can display your art on the outward side walls giving you much more display space for artwork that can be displayed on a wall. Do not have artwork on the ground that is normally displayed on a wall. I see many artists do this at our local First Fridays event. Many times at smaller art shows, the artists set up displays 1′-3′ out in front of their assigned 10′ x 10′ booth area. The problem with this is that the customers need to move 2′-4′ further away from the general traffic path when viewing your next door neighbor’s booth. This makes it harder for them to see their art and more likely to just pass on to the next booth. If your booths are right next to each other, I recommend that you keep within your assigned 10′ x10′ area. If the booths are spread out, you may be able to stick out a little and not disturb the next tents traffic flow. Another item that many artists have in there booth is a larger wall sign or banner with the company name on it. The initial costs for getting set up to show at art fairs can be substantial. If you decide to stop doing art shows, your equipment such as tent, walls, display cases and tables can be sold to other artists. Doing art shows is hard work. It does help with setup, sales and takedown if you have another person with you but many artists do it themselves. It is not for everyone. It can be frustrating if you go the whole day and sell nothing or very little which happens often. Selling at art shows can also be fun. I enjoy talking to the customers and sometimes they need to see you at a few shows before they purchase from you. It is best to learn about the art show market, how well your art sells and practice you’re selling skills on smaller and less expensive local art shows before going to the much more expensive art shows competing with seasoned full time art show professionals. This can save you money during your learning curve. Many art shows have volunteer sitters who will sit in your booth for a short time so you can take a short break. They will not sell your items, but will watch your booth while you are away. The artists must be at the art show for the entire show at most all art shows. Keep your cash on you and not store it in a cash box or hiding place unless it is just change. While you should sit in your chair to rest sometimes, it is best to stand if you can during the busy times. Having people in your booth brings in more people to your booth. 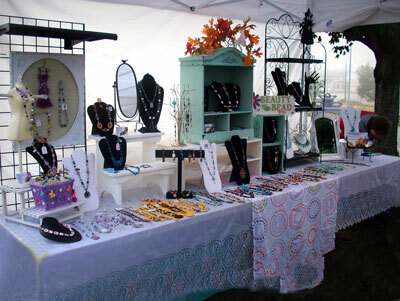 Special security precautions are needed for artists who sell jewelry not only during show hours but in your setting up, packing up, transportation and hotel room. You would never leave jewelry in your tent overnight even if the other artists leave up there art. My customers also let me know which of my pieces are more popular by their comments as well as by purchasing. If I want to bring in new artwork, I have a good idea of which pieces I should discontinue. If a piece of artwork has not sold yet, but seems popular, I will keep it around longer. When displaying art on your display booth walls, your back wall is viewed the most and your most impressive or best selling items should be on display in this location. A good article for new artist on preparing for Art Festivals at A Newbie’s Guide to Art Festival Booths.